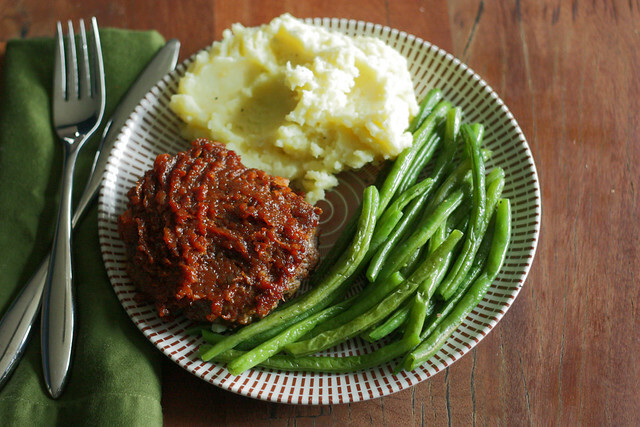 Meatloaf Burger Steaks with Tomato Gravy – Elly Says Opa! Like many kids, mine certainly have their moments where an old dinner favorite is suddenly cause for complaining it’s the WORST THING EVER, WHY ARE YOU DOING THIS TO US MOM? But, one thing that has remained consistent with Zachary from the moment he first tried meatloaf is that it’s remained his favorite meal. And one thing that will always make Ian eat something is barbecue sauce, which is pretty similar to the glaze on meatloaf. In other words, meatloaf is always a hit. This recipe gave me a way to get that family-favorite meal on the table in far less time. I like the added vegetables to the sauce here, too. My kids are not mushroom eaters, sadly, but when chopped very finely and mixed with ketchup and honey, they are apparently far more palatable (meaning: they didn’t even know they were in there). These little patties are really tasty, not terrible for you, on the table quickly, and make excellent leftovers. It doesn’t get much better than that. Place the first 5 ingredients in a food process and pulse several times until finely chopped. Use a fork to whisk together the panko, eggs, salt, and pepper in a medium bowl. Add the sirloin and lightly mix with your hands until combined. Form into 4 (1/2" thick) patties. Heat the oil in a large nonstick or cast iron skillet over medium-high heat. Add the patties and cook about 4 minutes per side. Remove from the pan. Add the mushroom mixture to the same pan and cook for 4-5 minutes or until the vegetables are softened. Add the wine and cook about 2 minutes until almost evaporated, scraping any browned bits off the bottom of the pan. Stir in the honey, ketchup, and Worcestershire sauce; cook 3 minutes or until slightly thickened. Reduce the heat to low and add the patties back into the pan, cooking 4-5 additional minutes, turning to coat in the sauce.